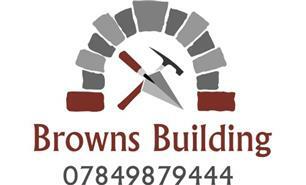 Browns Building Services - Builder, Plasterer based in Burmarsh, Kent. Les Brown the owner of Browns Building Service has been in the building trade for over 30 years learning his craft as an apprentice under a Master Craftsman.The experience and creative problem solving offered to clients is second to none gaining most of his contracts by recommendation from previous clients. Les is an expert in all wet trades ( rendering, plastering, bricklaying, screeding ) he has a wealth of experience in may other trade areas including roofing, building refurbishment, wet rooms, disability access, drives and patios. Nothing is out of his capability and no job is too large or small. If you call les he will give you honest advice and estimated costs on your future project. Browns Building Service is a quality building service with outstanding customer service. If you have a general building, maintenance or roofing need please contact us, our plastering and rendering service is specialist and will not disapoint.